Five years previously, Elder Frederick Plummer had begun to preach in the small nearby school house to which he was driven by horse and buggy from his home in Philadelphia each Sunday. It was the enthusiasm of the congregation that made possible the erection of the small but adequate church building, a picture of which appears at the head of this column. The original deed was given by George Stacker and his wife, Eleanor, to George Righter, Isaac DeHaven, Andrew Supplee, John Henderson Supplee and Peter Richards. It was signed and witnessed on September 3, 1835. This building served the needs of its congregation until the present church was build some 60 years later. Other milestones along the way of church progress had been the staking out of the cemetery in 1845, when lots in it were sold for seven dollars each. The vault under the church was built in 1849. The wall around the graveyard was built in 1851. At this time the horse sheds were also erected. Among the important church events of this period were the union of the Gulph Christian Church with the Philadelphia Conference in 1851, and the incorporation of the church itself in 1859. A new deed was given to the Christian Church, at Gulph Mills, by George Righter, Isaac DeHaven, J. Henderson Supplee and Peter Richards, the surviving trustees to whom the first deed had been given. In 1870, nearby ground was purchased for the erection of a parsonage which was built that same year. This served its purpose until 1952, when the new parsonage was built. Year by year church membership had increased, and with the increase came auxiliary organizations such as the Sunday school, organized in 1843 with J. Henderson Supplee and Joseph Davis as superintendents, and the Christian Endeavor, organized under the guidance of the Rev. Elwood G. Hall in 1891. With Mrs. J.B. Fenwick, wife of the pastor, as its first president, the Ladies’ Aid was organized in 1901 to help with the work of the church. The Men’s Bible class was organized in 1912. With the inauguration of these increasing activities, more space was needed than the original small church provided. And so on July 29, 1893 – to quote from a church booklet printed in 1953 – “a building committee was appointed, and told to do its best towards the building of a new church for $5,000.” Even more than 60 years ago, this sum was evidently not quite adequate, for it was later raised to $6,000. The church building which was erected by a Mr. Burns, a contractor from Berwyn, was modeled after St. Martin’s Church of Canterbury, England. The cornerstone was laid in 1894 and most remarkable of all, the church was dedicated free of debt in March 1895. In October 1929, representatives of the church were sent to a meeting in Piqua, O., where they took part in an event that helped make church history in the United States. For it was then that, at a general convention of the Christian Church, this denomination and the Congregationalist merged. These were the first denominations in the United States to form such a merger. 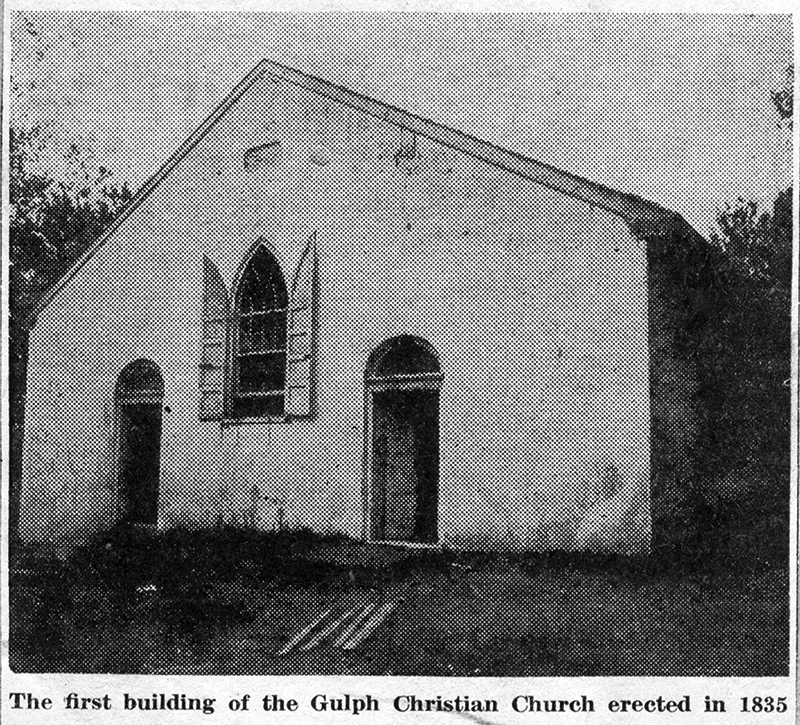 In the spring of 1932 church trustees purchased the old school property adjoining the church, thus acquiring the quaint little building in which, almost 100 years before, Elder Plummer preached his first sermon for what is now the historic Gulph Christian Church. This old school house is one of the most historic buildings in the area dating back to pre-revolutionary days. With an added second story, it now serves as an educational building.